Everybody loves chocolate, and this gift basket was created to make for the ultimate gift all year round! With this exclusive selection of Lindt and Godiva chocolates and Moet & Chandon champagne a smile is guaranteed! And to put the icing on the cake, a white teddy bear! 1 bottle of Moet & Chandon champagne(75 cl). 1 box of Lindt chocolates. 150g. 1 box of 24 Godiva chocolates: 8 dark chocolate (85% cocoa) 8 white chocolate and 8 milk chocolate. 1 small teddy bear with a bow. Size: 18cm. Presented in a wicker basket. A sweet gift! 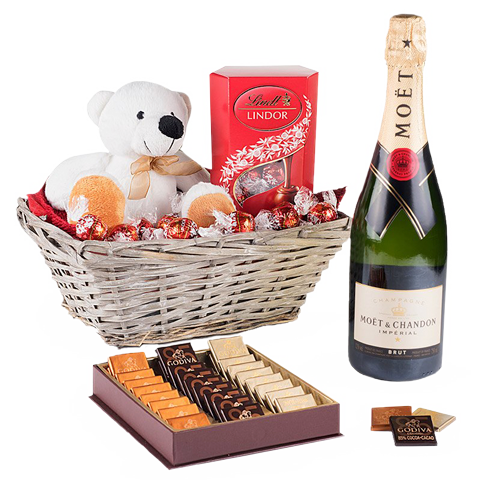 Celebrate without words when you send him or her this delicious gift basket: Moet & Chandon, chocolates and a teddy bear. Make their day special and send it now!